Indulge yourself in this luxurious 3" all natural talalay latex mattress topper which will bring years of pressure relief and help to rejuvenate sore muscles much faster than other types of mattress pads. This topper is available in either a plush N2 20-24 ILD, medium N-3 #25-29 ILD or firm N-4 #30-34 ILD. As is all of our latex this topper is Oeko-Tex 100 Class 1 certified to be free of harmful chemicals and safe for infants. 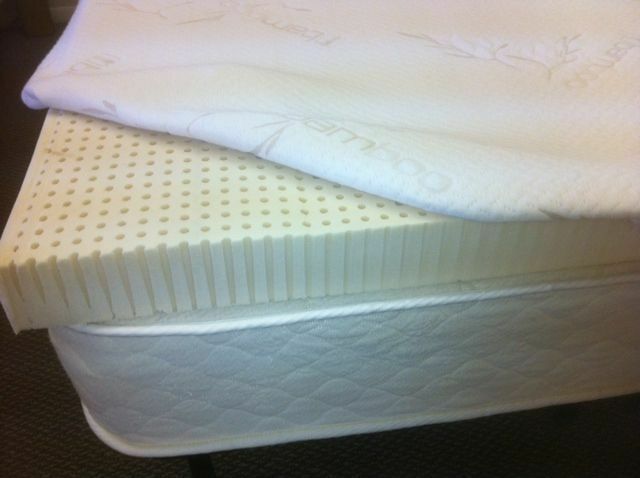 This topper does NOT include a protective cover however we do offer a very nice bamboo zippered cover for this 3 inch natural talalay latex mattress pad. These are guaranteed to be first quality and come with a full 5 year non pro-rated warranty to be free of defects. Latex is prone to slight flaking over the years and a protective cover is highly advised. Direct sunlight is the #1 enemy of natural latex products. Sizes are King 76 x 80, Cal King 72 x 84, Queen 60 x 80, Full 53 x 74, TwinXL 38 x 80 and Twin 38 x 74.